I made another mini for our quilt gallery! 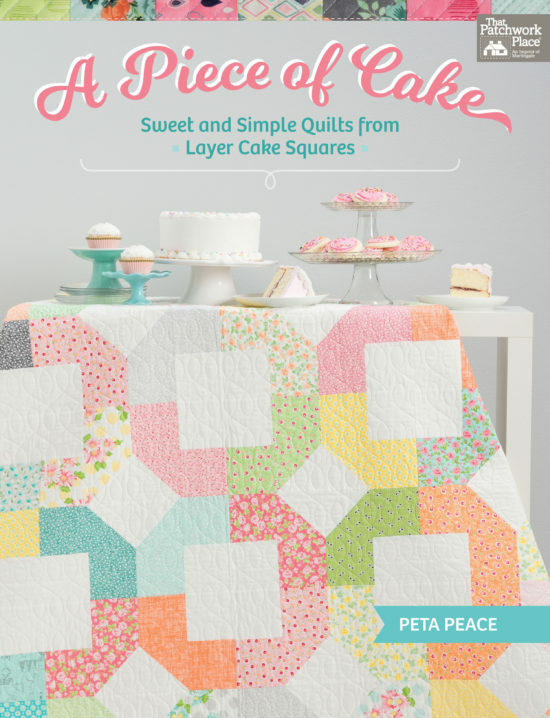 The pattern is "Square Peg Miniature Quilt" from the book, "A Piece of Cake" by Peta Peace of She Quilts A Lot blog. I used a Candy Charm pack called "Simply Style" by V and Co. for Moda. I used 40 of the 42 squares to put together this 15" square miniature quilt. Once I had it together, I wasn't very happy with the light colored squares that faded into the white Grunge background. I took those squares out and filled in with stash. 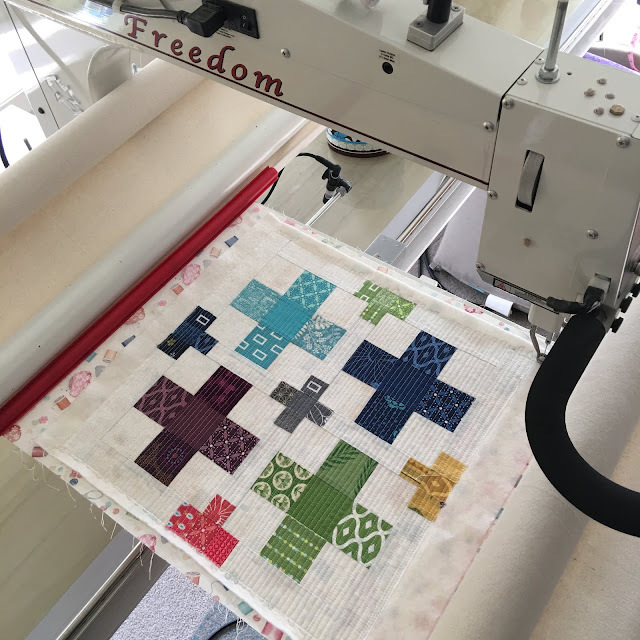 Here it is on my longarm bars after the makeover, getting some matchstick quilting. The back is a sewing notions fat quarter. I hung it with a cut off yardstick tucked in corner squares (5" squares, folded in half diagonally) and some 3M Command velcro strips. While I was quilting today I was looking out the window at all these beautiful red trees and pink chrysanthemums in our backyard. 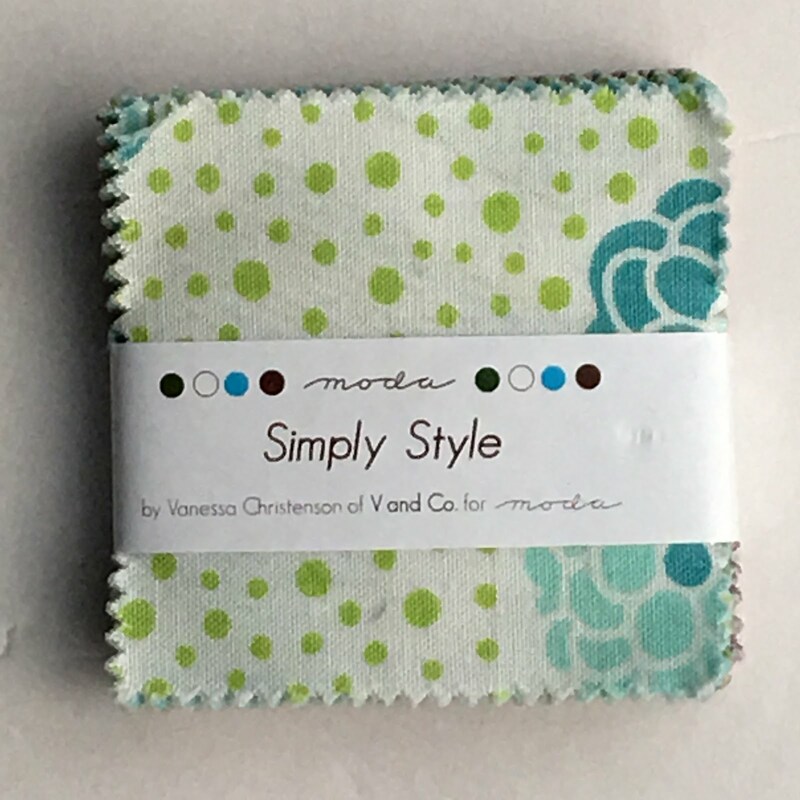 I love this mini quilt! Your stairwell mini quilt gallery is so inspiring. I only have one quilt in my stairwell! I love seeing your fun new mini hanging with all the rest, really fun Nancy! Another fun mini! I like the backing fabric too! I'm trying to find a place for a mini quilt wall in our house. It's such fun to see all your minis on the wall -- so many different ones and so colorful! Love your stairwell of minis! Look at that gallery!! Your latest mini is going to be a great addition to the gallery! Very cute mini! Great addition to your wall. I have that charm pack! You made good use of yours - I'm still pondering what to do with mine... Love the quilting! 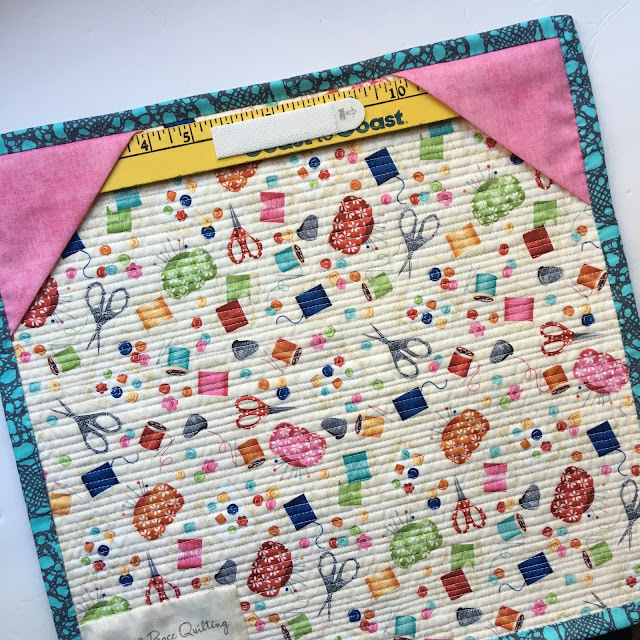 Love your mini quilt gallery! I need to make one. Thanks for linking to Finished or Not Friday. Great quilt! I think swapping out the lower volume squares was a smart choice, they really pop now. Great way to use the mini charms. 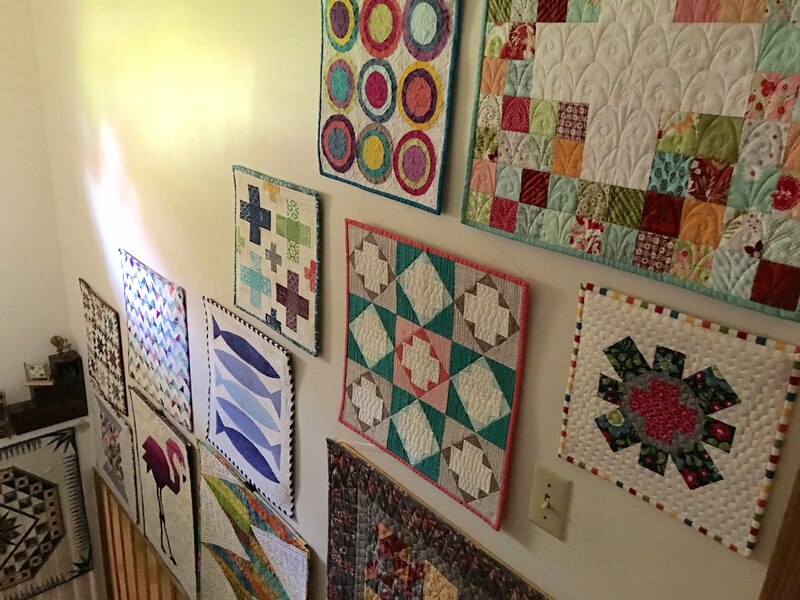 Your display of quilts along the stairway looks wonderful. Very nice! I love plus quilts. 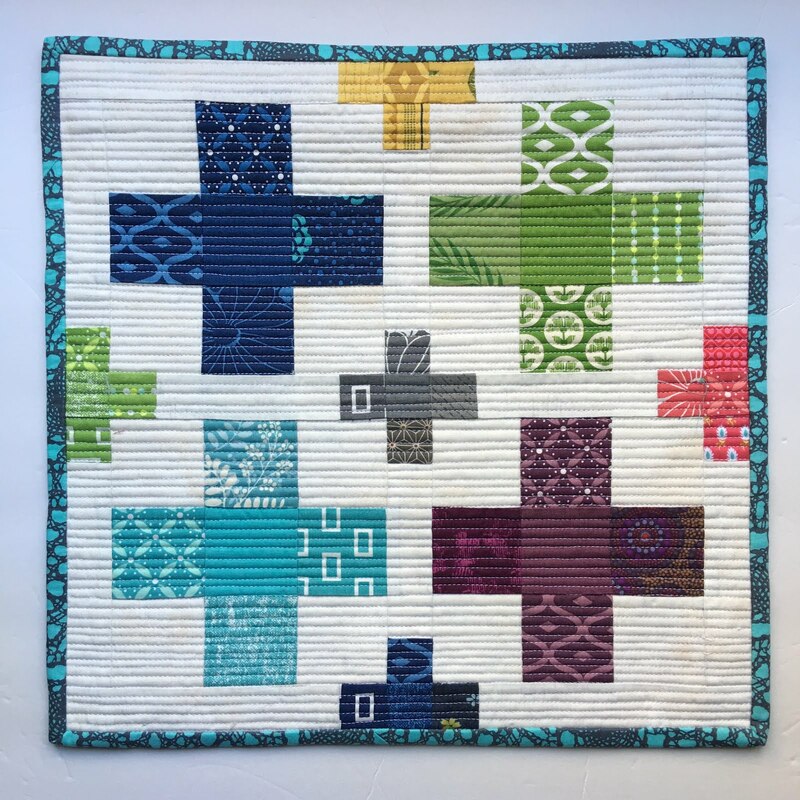 It is a beautiful addition to your quilt wall! 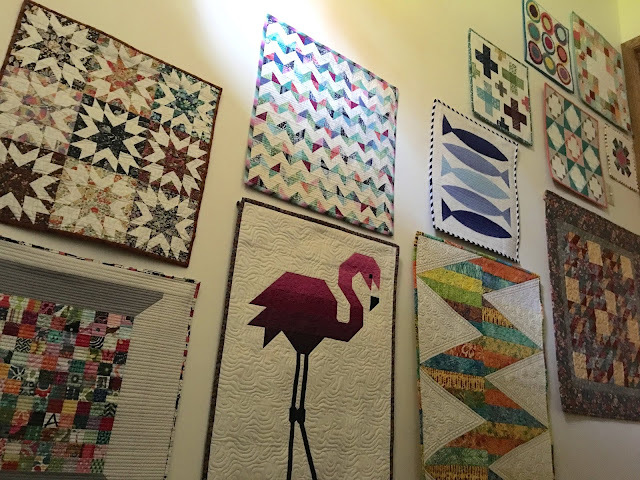 Your quilt wall is such a gorgeous combination of traditional and modern. Pretty quilt, beautifully quilted. Love the quilt show in your stairwell. What a great way to showcase the minis - You can enjoy them every time you go up and down stairs. The pattern for this one is great. 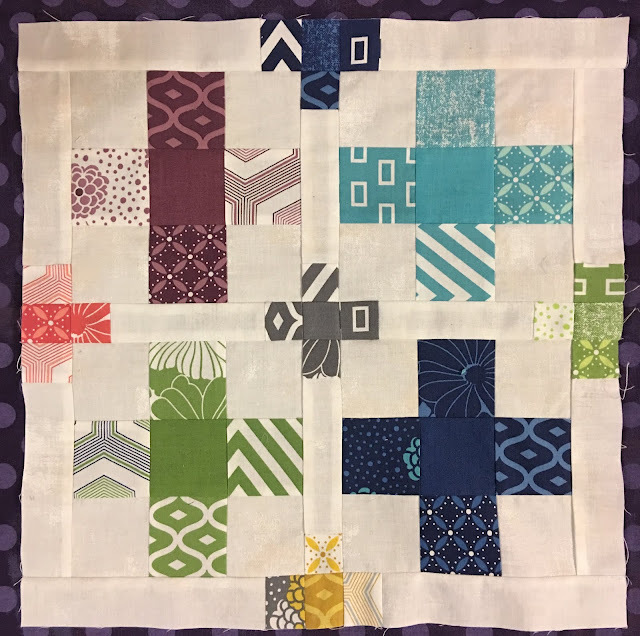 I love a Plus quilt of any size. I really like your quilt! Great idea for those mini charms I collect! Your stairwell is so beautiful! Take good care, my dear!